Forbes Magazine, not a very pro-environmental or pro-renewable energy publication, seems to take great glee in the suggested collision between the California Condor and wind turbines being built in the Tehachapi Mountains. But what the author fails to mention is that Bird/Wind Turbine Collisions account for a miniscule number of avian fatalities each year and brings up a new electrical transmission corridor as a benign part of the landscape (bird/electrical line collisions are the 2nd highest cause of avian deaths) per the US Forest Service. The article admits that no condors have been killed – yet. So, it ends up reading like a hatchet job against renewable energy wrapped up in faux concern for the condor. What’s next – an article about birds being cooked by reflected sun light at solar thermal power plants in the Mojave? Altamont is the first generation of wind farms, and historically has a significantly higher level of avian kills than all other wind power sites. 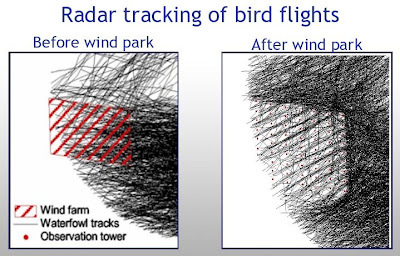 Research shows that most birds fly around wind farms instead of through them. A technical workshop will be presented demonstrating the use of new free software to estimate bird and bat fatalities at wind energy facilities in California and beyond. This entry was posted in ecology, energy, sustainability and tagged avian deaths, bird strikes, renewable energy, wind turbines by Barry Lehrman. Bookmark the permalink. Well done. Where did you get all of those charts? Raptor mortality vis wind power.